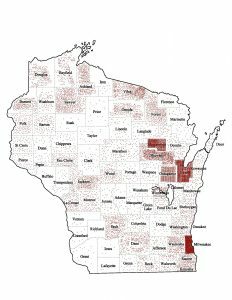 Each dot on the map represents one (1) American Indian student in grades K3 to 12 according to the enrollment numbers reported in 2013 by the WI Department of Public Instruction. Right click on the map and select “Save link as…” download a high resolution PDF file with bookmarks to each county. NOTE: The location of the dot is arbitrary and is NOT intended to indicate the location of an actual student within the county boundaries. If you have any questions about this information or other data on this website please contact Maurina.